Hybridization of dentine is identified as a basic bonding mechanism between resin and dentine, hence studying the micro morphology of hybrid layer may explain lower bond strength that has been observed in primary teeth. The aim of the present study was to compare the thickness and micromorphology of Hybrid layer formed in primary and permanent teeth for 3 different durations of dentine etching time (5, 10 and 15 sec) with 10% phosphoric acid as etchant. Thickness and micromorphology of hybrid layer was observed on SEM photographs obtained at 750X. Results indicated that primary teeth presented with a significantly thicker hybrid layer compared to permanent teeth at 10 sec (P<0.05) and 15 sec (P<0.01) of dentine etching. It was concluded that owing to the high reactivity of primary teeth to etchants, the etchants be applied for shorter period on primary dentine compared to permanent dentine for better performance of composite restoration in primary dentition. The study was designed to determine dental age from orthopantomograph using Demirjian method and to investigate applicability of Demirjian method for estimation of chronological age in children of Belgaum. The sample for the study consisted of 197 subjects between 6-13 years of age. When Demirjian method was applied to Belgaum children, mean difference between true and assessed age for males showed overestimation of 0.14 years (51 days) and females showed overestimation of 0.04 years (15 days). Demirjian method showed high accuracy when applied to Belgaum children. 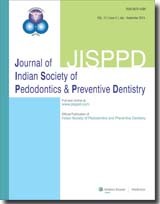 An epidemiological investigation was carried out to know the prevalence of Dental Caries amongst 1257 children in the age group of 5, 8, 11 & 15 years respectively attending schools in the city of Cuttack, Orissa. The examination was carried out under natural light and dental caries was diagnosed according to W.H.O. Criteria 1983. The point prevalence of dental caries was recorded to be 64.3% with an average DMFT of 2.38. The prevalence of caries showed a pattern of occurrence i.e. prevalence consistantly increased from 5 years to 8 years age group and subsequently decreased at 11 years and 15 years age. Regarding treatment needs, 63.6% children required dental treatment for various reason and it is in accordance with dental caries prevalence of different age group. Young chronically ill children receive a greater sugar load from liquid medications than do healthy children. They receive variety of oral liquid medications that healthy children do not This study was planned to know the levels of oral hygiene and Dental caries in children on long term liquid oral medicines (LOM) and to know out if any difference existed between these and children not on LOM. 51 children on LOM were compared to 54 not on LOM after equalising for age, oral hygiene and diet intake. Highly significant difference was found for dmft and dmfs in 2-6 year age group and dmft+ DMFT for 6-13 years age group, mostly posterior teeth were affected and for this the difference was statistically significant in 2-6 year old children. Percentage of children with dmft>5 significantly increased in 2-6 years old children on LOM, when compared to that of control. Percentage of various grades of lesions (relating to the severity) also increased with an increase in the duration of LOM. Dental caries and periodontal disease, the most commonly seen disease show striking geographic variation, socio-economic patterns and severity of distribution all over the world. Hence, an attempt has been made to determine the relationship of oral health status with socio-economic status in Davangere town. A total of 2007 children of 13 to 14 years age belonging to both sexes were examined. Type III examination was carried out during the survey. DMFcaries Index and Oral Hygiene Index was used to assess caries experience and oral hygiene status. Prasad's classification was used to know the social classification of the children. It was concluded that dental caries experience and oral hygiene status of children are strongly correlated to socio-economic status. Posterior composite resins have gained considerable importance over last few years. However, improper placement techniques continue to be a prime cause of failure of these restorations. This study was done to compare the microleakage at the tooth restoration interface extending below cementoenamel junction when posterior composite restorations were placed directly in the cavity or when placed over a glass ionomer cement liner, both chemically cured and light cured. The results have shown that light cured glass ionomer when used as a liner under a composite restoration used below gingival cementum/dentin margin has the best sealing capability. The universal phenomenon of introducing weaning diet to the growing child sets its onset by the age of 4-6 months. This preliminary diet of the child governs his or her dental health in the long run. The main objective of this study is to investigate the histopathological and clinical invasion of deciduous teeth exposed to both the homemade weaning diet and commercial formula feeds. The study also aims at motivating the consumption of the most appropriate diet for the weaning baby. Extracted deciduous teeth were incubated with the test solutions of homemade diet and commercial formula feeds for the period of 6 weeks. Fewer carious invasion both clinically and histopathologically were seen in homemade feeds. Thus, homemade diet can be a strong candidate for the status of 'THE IDEAL WEANING FOOD'. A case of 13 old year is presented with supernumerary maxillary premolars one on either side. Radiograph revealed presence of five more supernumerary teeth unerupted in both maxilla and mandible. The implications of early diagnosis and management to prevent further complications are discussed.